When we talk about types of soil, we are usually talking about whether the soil is predominantly sand, silt or clay. It is important to know the difference because gardening in sandy soil is quite different from gardening in soil that is mostly clay. The reason for this is that the size of the soil particles is very different. A particle of sand is much bigger than one of silt, which is much larger than a particle of clay. To illustrate this, I've lined up some items on the windowsill to help you get a visual sense of the differences. Now imagine what happens when it rains. If you have sandy soil, it's like putting the cherry tomatoes in a colander and running water over them. As soon as you turn off the faucet, water runs right through those big pore spaces, leaving just a thin coat of moisture on surface of the tomatoes. If you are gardening in sand, you know this - without organic material added to the soil to soak up and hold onto water, it dries out in no time. You can think of silty soil as being like the grains of rice. 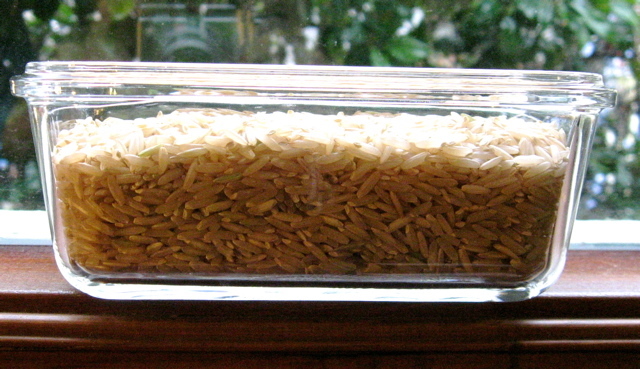 When you run water over rice, it drains slowly, leaving quite a bit of moisture both coating the grains and held in the small spaces between them. Clay particles behave a lot like flour. They are so tiny that they pack in tightly together with very little space between them. If you pour water on flour, it will just sit there until you mix it in. Once you've mixed it in, however, it is very hard to completely dry it out. OK, so that's how soil particle size affects water retention. Particle size also matters when it comes to nutrients. Ions of nitrogen, potassium, phosphorous, calcium, magnesium, sulphur, etc. cling to the outer surface of soil particles where they can be taken up by plants. Smaller particles, like silt and clay, have far more surface area per volume than those big particles of sand and therefore can hold a lot more nutrients. Bear in mind that this is a very simple explanation of soil types. It is enough information to help you make some reasonable decisions about how to improve your soil, which I'll talk about in the next post on soil amendments. But it by no means covers the subject. Healthy soil is more than particles, it includes organic material and many living organisms working together. I strongly recommend that gardeners learn more about that fascinating world under our feet. James Nardi's book, "Life in the Soil: A Guide for Naturalists and Gardeners ," is a good place to start. Remember that unless you are right on a sandy beach, your soil is likely some combination of particles. If you aren't sure whether it is mostly sand or clay, you can do the "squeeze" test. Pick up a handful of moist soil and try to make it into a ball. If it packs nicely into a ball, it has a lot of clay in it. If it crumbles without holding a shape, it is mostly sand. 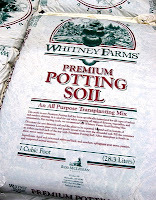 Wondering how much mulch, soil or compost you should buy for your gardening project? Check out this handy table. 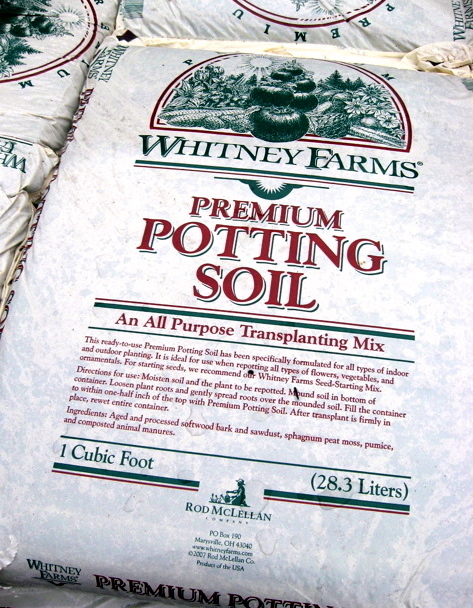 When you go to a garden center, you'll find lots of bagged goods with names like potting soil, planting soil, top soil, bark, fine bark, play chips, compost, mushroom compost, planting compost, etc. There's chicken manure and steer manure and bat guano (more manure). Some companies sell three-way and five-way mixes of various ingredients that claim to be excellent growing media. With so much available, how do you choose which, if any, of these products are right for your garden? The first step is to understand what these materials really are. There's a lot to say about some of them, so I'm going to do a series of posts to tell you about soil, soil amendments, compost and mulch. Soil, also called dirt, is the foundation of your garden. The health of your soil determines the health of the plants you grow. If you are at all serious about gardening, particularly if you plan to grow some of your own food, you owe it to yourself to learn about the soil you have and how best to maintain its tilth or health. Technically, soil is a combination of sand, silt and clay particles with some amount of organic matter mixed into it. There is no precise recipe for soil. The soil you have is the product of the wind, weather and geology of your area. Thanks to the action of glaciers long ago, soils in the Seattle area are varied. Some of you are gardening in sandboxes. Some of you are trying to break up clay. If you are gardening in an area along a river, you might have silt. Many of you are finding rocks the size of your fist nearly everywhere you dig. All of these scenarios are the gifts of what is called "glacial till." The combination of sand, silt and clay particles you find in your garden is what makes up the structure of your particular batch of soil. Organic material comes and goes over the seasons. Nutrients and water are taken up by plants. Depending on the health of your soil, microscopic organisms thrive or struggle. Through it all however, year after year, those sand, silt and clay particles remain, providing the stage where all the rest is played out. There are many things you can do to improve your soil, but there is nothing you can do that will change the type of soil you have. A clay soil, for example, cannot be changed into sandy loam, no matter what you add to it. (In fact, as I'll explain in a later post, adding sand to clay is a bad idea.) Your best bet is to know what type of soil you have, what its characteristics are and how to make the most of what you have. In Part 2 of "Here's the Dirt," I explain more about soil types. 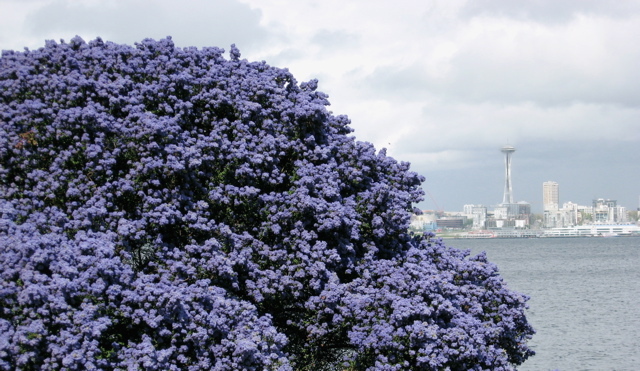 Ceanothus, also known as California wild lilac, is starting to bloom now in Seattle. Its striking, purple-blue flowers are shaped like tiny bottle brushes, thus inspiring the common name. There are many varieties of Ceanothus, but few are hardy enough for our climate. Most are native to California where, after a wet winter like this past one, the coastal hills are covered in a blue haze of bloom in the spring. The most common variety of Ceanothus grown in Seattle is the one shown above, Ceanothus impressus or Santa Barbara Ceanothus. If you add one to your garden, be sure to give it plenty of room - it can easily get 10 feet tall and 10-15 feet wide. Flower color among the varieties can range from white (which is rare), through pale blue, to deep purple-blue. When choosing one for your garden, as always, buy plants in bloom to be sure of what you are getting. Ceanothus plants are generally drought tolerant, needing a bit of supplemental watering the first couple of seasons while they get established. There are a couple of Ceanothus ground covers that are grown in our area. Point Reyes (C. gloriosus) has glossy, dark green, holly-like leaves, with light blue flowers, and can get as tall as 18", with a spread (if it is happy) of 12 to 16 feet. The most striking Ceanothus ground cover is 'Diamond Heights,' (C. griseus horizontalis 'Diamond Heights') shown above. It does not look anything like its relatives until small, pale blue flowers appear in late spring. But flowers are not the reason to plant this beauty. 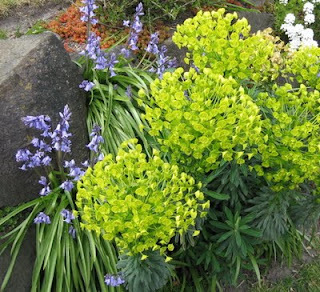 You'll want this in your garden because of the foliage - those yellow-green leaves with splashes of dark green in the center are a joy to behold. Unfortunately, we've had some very cold weather the past three or four winters and this ground cover has not fared well. My once-thriving 'Diamond Heights' specimens have all been killed by the cold. However, that doesn't mean you should give up on this plant. Just treat it as an annual, tuck it into containers and let it spill over the edges. 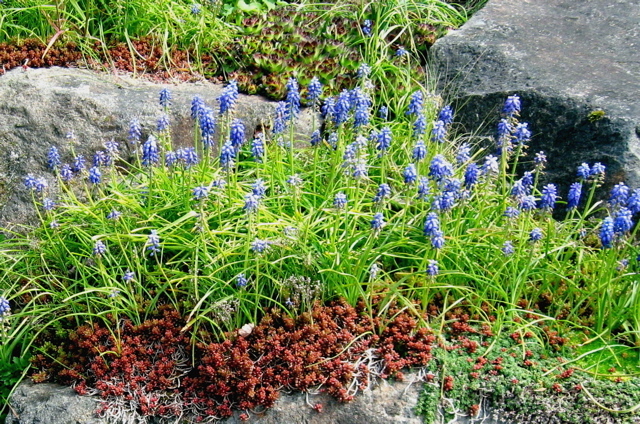 OK, here's Part 2 of our virtual plant identification tour of Seattle rockeries. This is Bergenia crassifolia, or winter blooming bergenia. It is also called "pig squeak" because the leaves make a squeaking sound if you rub them when they are wet. 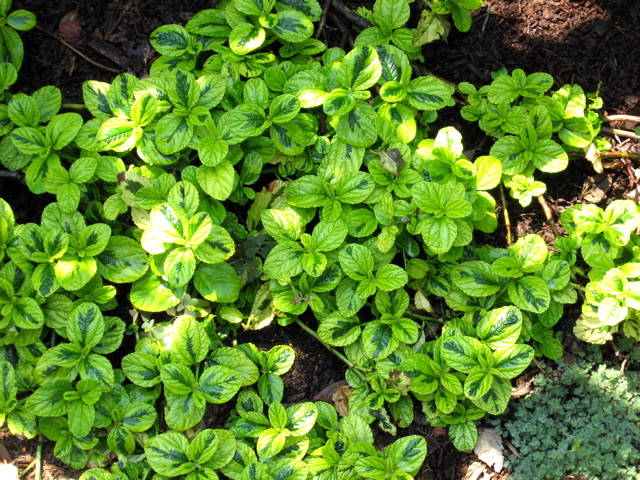 This is an evergreen perennial that requires little care. Just cut away old or cold-damaged leaves and faded flowers to keep it tidy. These chartreuse flower heads belong to Euphorbia (I'm guessing this is a young specimen of E. chariacias wulfenii) a large genus of plants that includes the poinsettia (E. pulcherrima). Be careful handling these plants. They have a milky, white sap that is very irritating to the skin - I always wear rubber gloves when working with them, having been burned (literally!) in the past. Along with them, a collection of English bluebells have taken up residence. Rarely planted on purpose, you'll find these cheerful blue flowers in gardens and rockeries everywhere in Seattle. Speaking of blue flowers, these are grape hyacinths (Muscari sp.) These also happily multiply wherever they are planted. The red plant below them is a variety of Sedum. 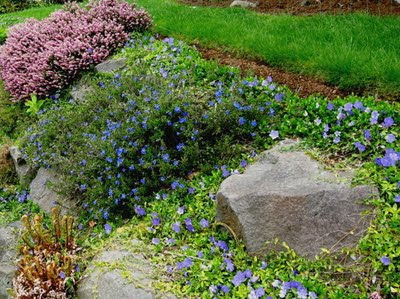 Of course, rockeries are not all planted with ground covers and small perennials. When the planting pockets are large enough, small trees and shrubs can do quite nicely. 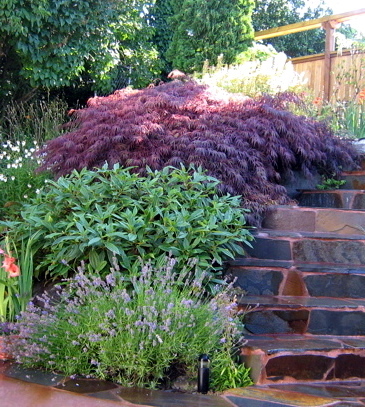 Here at the top of the rockery is a weeping Japanese maple (Acer palmatum 'Dissectum Atropurpureum'), below it is David's viburnum (Viburnum davidii), and at the bottom, lavender (Lavandula sp.) is blooming. Rockery gardening can be challenging because the planting spaces are often quite small and they dry out quickly in warm weather. Watering can be difficult because the force of the water stream can wash away some of what little soil is there. But after some trial and error, you will find a planting combination that will thrive with a minimum of care. Missed the first part of the tour? 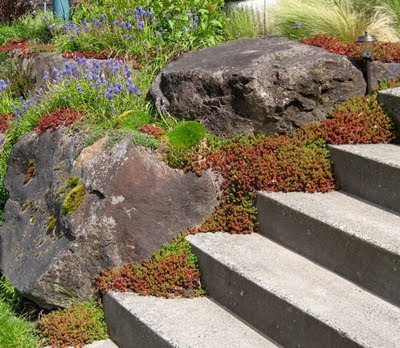 As I said in my post on retaining walls and rockeries, Seattle is a city built on hills. Those hills are terraced with miles and miles of rockeries, which are planted, both accidentally and on purpose, with thousands and thousands of plants. Many of these plants bloom in spring, lining our streets with mini-explosions of color. If you have ever wondered what any of these plants are, I'm here to help. In the next two posts, I'm going to take you on a little virtual tour of Seattle rockeries to help you identify some of the many plants you see blooming there this time of year. 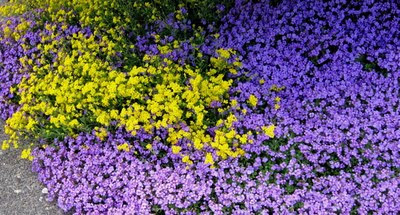 This is a classic rockery plant combination: yellow Alyssum 'Basket of Gold,' paired with purple Aubrietia deltoidea. 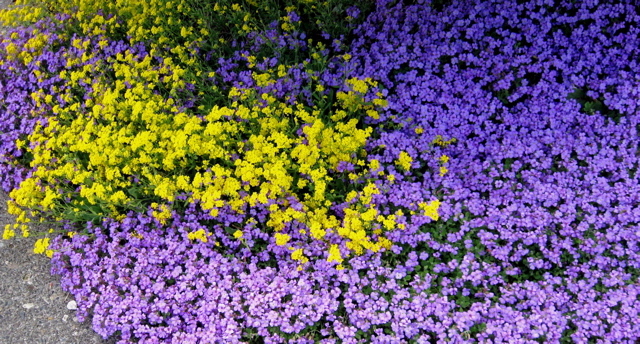 Aubrietia comes in both dark and lighter shades of purple; less common is a variety with deep rose colored flowers. 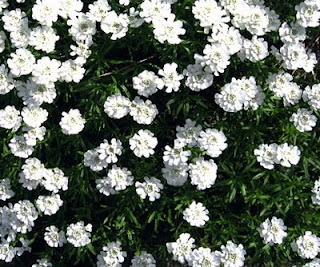 Candytuft (Iberis sempervirens) is a tough perennial with a long bloom time. It's one of the true bright whites (along with shotweed flowers) that you see early in the season. If you have this plant in your rockery, be sure to shear it after blooming to keep it from getting leggy. The red and green succulent plant spilling out onto the stairs is one of the many varieties of Sedum available in our area. Sedums are particularly well suited to life in a rockery because they require very little in terms of water, nutrients and care. The pink flowers on the left are heather (Erica sp. ), the medium blue flowers in the middle are Lithodora, and the light blue flowers at right are periwinkle (Vinca sp). As with candytuft, all three of these should be sheared or cut back after blooming to keep them compact. In the lower left corner, new fronds, called fiddleheads, are emerging from a fern. To keep ferns looking tidy, cut away old, dried out fronds in late winter/early spring. Do you have trouble telling one conifer from another? 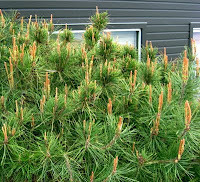 Do pines, cedars, firs and spruces all look the same to you? Well, after you read this post, you'll be able to tell the pines, at least, from all the others. 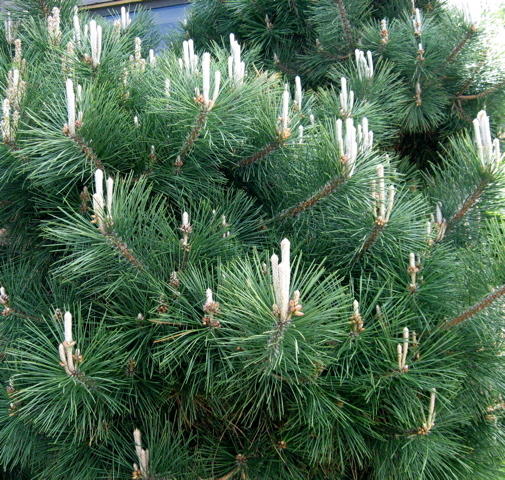 Here's how: pay attention to evergreen trees in your neighborhood this week. You'll notice that some of them have new shoots emerging from the tips of their branches that look like fingers pointing toward the sky. These shoots look as if the tree is making the kind of rude gestures that humans do when they've been cut off in traffic. But don't take this personally, because these "fingers" are simply the beginnings of this year's growth for the pine tree. 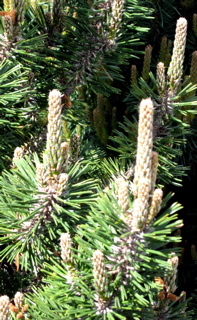 No other conifer produces shoots that look like these, so when you see them, you know the tree is a pine. Over the next few weeks, these shoots, called "candles," will grow longer and shortly after that, new needles will appear along them. Depending on the type of pine, this will add anywhere from one to eighteen inches to the size of the tree. And that some have yellow candles. But they all work the same way. You can shape a pine tree over the years by pinching the candles to stop or slow the growth of a branch. If you don't want a branch to add any new growth for the year, cut the candle completely off. If you want it to add some growth, but not too much, cut off just a portion of the candle. This technique is used in formal Asian gardens to train pines into a specific shapes. As a bit of pine trivia, you might be interested in the fact that pine trunks offer a sort of record of the amount of rainfall from year to year. If you look closely at the tree on the left, you can see that there's bare trunk for several inches, then a whorl of branches, then more bare trunk, another whorl of branches, and so on. The distance from one whorl to the next is one year's growth. In rainy years, the trees grow more and the distance between whorls is longer; in drier years, it is shorter. 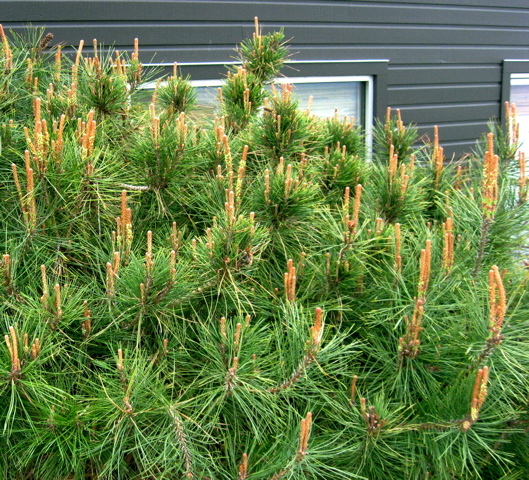 There are many pine varieties that grow well in the Seattle area. If you want to know more about them, the Sunset Western Garden Book has a lengthy section on types, growth rates, habits and more. One of my favorite woodland plants is beginning to unfurl in my garden right now. 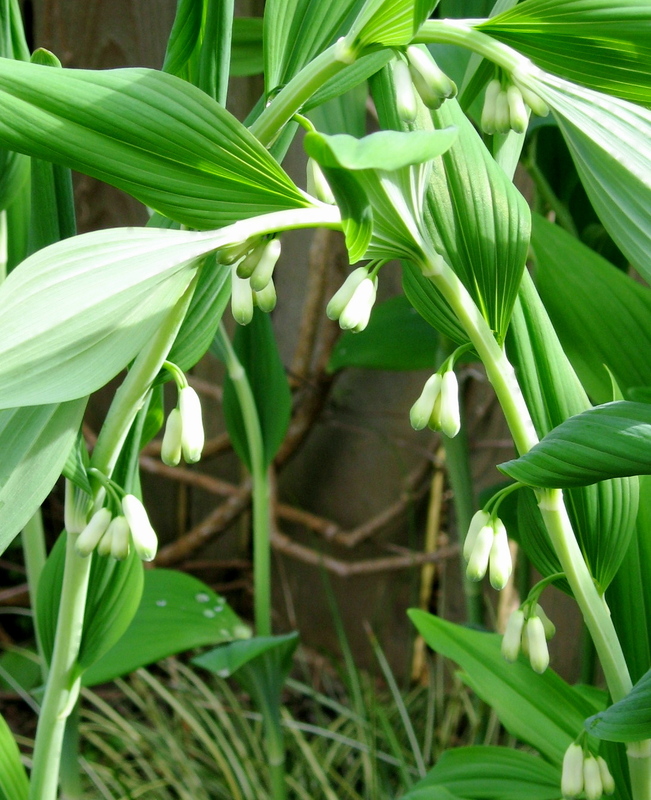 It is Solomon's Seal (Polygonatum odoratum). This herbaceous perennial (herbaceous meaning that the foliage dies down in fall; perennial meaning that it comes back year after year) is always one of those great surprises in the garden in spring. Even though I know where it is planted, it is astonishing to see it rise up out of the ground in just a matter of days, from little pointy "noses" barely poking out of the soil to 4 foot tall arching stems. The underside of the stems is lined with double rows of bell-shaped flowers that are slightly fragrant. The flowers fade in time, but the arching stems continue to grace the garden until late October, when the leaves turn yellow and fall, and the stems die back. 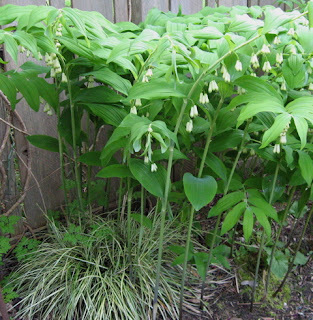 Solomon's Seal likes shady, woodland garden settings. 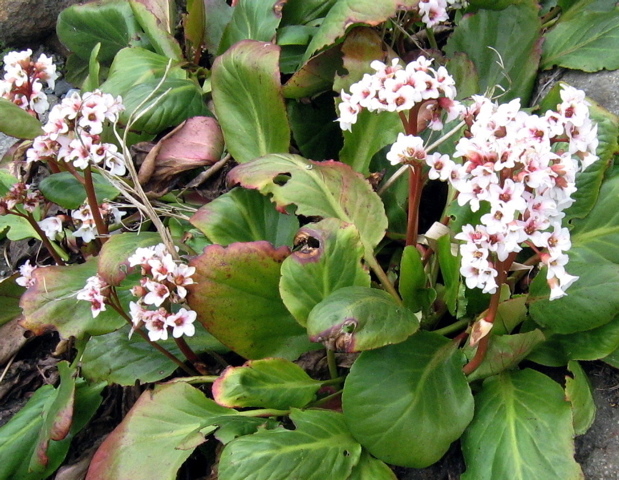 The cultivar, 'Variegatum,' has white edges on the leaves and its stems are dark red when they first emerge. This plant spreads via underground rhizomes. To propagate, divide clumps in early spring. You'll need a sharp shovel for this job, as the root/rhizome balls are dense. This plant is in the same family (Liliaceae) as the Northwest native, False Solomon's Seal, but not in the same genus. If you are looking for the native at local nurseries, the botanical name is Smilacina racemosa. The plants are easy to tell apart when they are in flower. 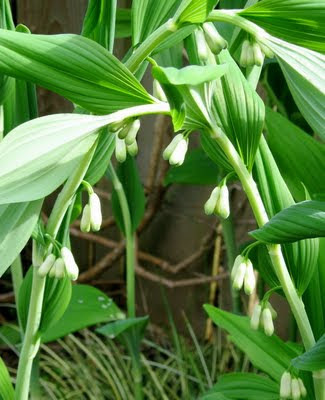 False Solomon's Seal has a conical spray of tiny white flowers at the end of each stem and no flowers under the stems. Without flowers, the plants look very similar.